Extra strong (N45) and plated with real gold! Ideal for stylish posting of notes. Holds 7 pieces of A4 paper to a metal surface! The adhesive force on a piece of steel is over 1/2 kg! The north and south poles are located on the two largest surface areas above and below when the magnet is laid flat. 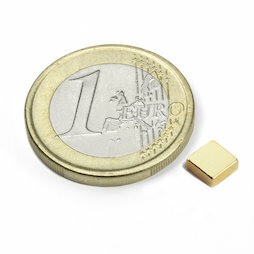 The 2 mm gold blocks can be playfully combined with the 5 mm gold cubes. Discover the Aztec in yourself! A heavy hole punch (1,1 kg) hangs on a few hundred Q-05-05-02-G magnets from the ceiling. A sphere magnet helps to produce a good connection with the hole punch.